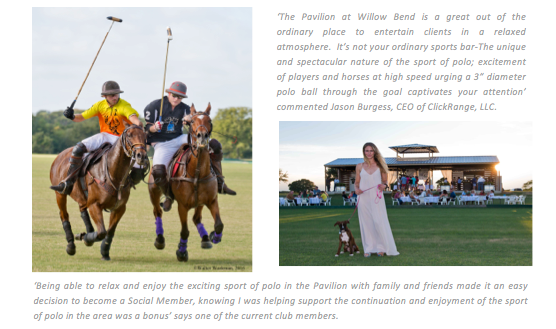 OAK POINT, TEXAS – August 27, 2017– The Fall season at the Willow Bend Polo Club has arrived and 2017 polo activities to resume Friday, September 8, 2017.Willow Bend Polo Club will resume it’s 2017 polo activities, Friday, September 8, 2017. Players have their ponies out of the pasture and dusted off their helmet & boots and are saddled up for some POLO! With the unseasonal rain during the months of July and August, the fields are green and lush. Polo enthusiasts are welcome to come and enjoy the cooler fall weather and for those wanting to mix and mingle with the players as well as enjoy access to our viewing pavilion, after polo events and Friday evening Asado, please remember to purchase your Social Membership and guest passes, which are available online at www.willowbendpoloclub.com. Willow Bend Polo Club is strategically located on 275 acres of sandy loam soil in a pastoral setting within 45 minutes of downtown Dallas. Our facility includes 3 outdoor polo fields, a 1-mile exercise track and boarding for over 100 polo horses. We are a member club of the United States Polo Association and we offer an intro to polo “Polo Experience”, clinics, lessons and highly competitive USPA tournaments centered around fun and entertaining social activities. If you would like more information about this topic, please contact Andrea Walton at 972-294-4700 or email at andrea@willowbendpoloclub.com.